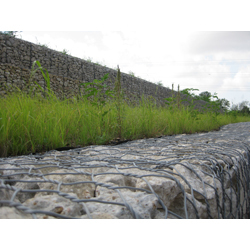 GalMac is a corrosion-resistant coating available on Maccaferri’s full line of double-twist wire mesh products. It provides increased durability and lower life-cycle cost compared to galvanized wire, lasting at least two times longer in demanding environments. Additionally, it is 100% American steel, fabricated domestically in Maryland, making it a viable option for federally funded projects.